Mean Diameter(D):is used in the stress and deflection calculations, and is equal to half the sum of the outside and inside diameters. Wire Diameter(d):.It is the diameter of the wire used to manufacture the spring and is a factor used to calculate spring index. Internal Diameter(ID): is specified when the spring will function over a rod or shaft . Internal diameter of a spring can be calculated by subtracting the doubled wire diameter from the external diameter of a spring. External Diameter(OD): is specified when the spring will function in a cavity External diameter of a spring can be calculated by adding the doubled wire diameter to the internal diameter of a spring. Pitch(P): the distance between wire centers in adjacent active coils. Current recommended practice is to specify the number of active coils rather than pitch. Block Length(LC): Maximal length of a spring after total blocking. This parameter is shown in the picture on right. free length(L0): the overall length of an unloaded (“free”) spring. Nr of coils: This is a total number of coils in a spring - in the picture above it is equal to 11. To calculate number of active coils substract two terminating coils from total number of coils. Music Wire: Steel that conforms to the EN 10270-1 class SH standard. Inox steel: Inox 18/8 mark Z10 CN 18.09. Cr-Si Steel: Cr-Si Steel. Springs created from this material have better endurance and spring rate. 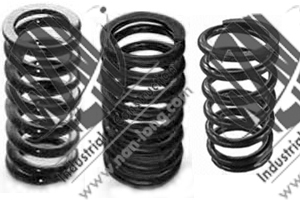 Spring rate: Tolerance for spring rate is in resonable range or customer's enquiry.